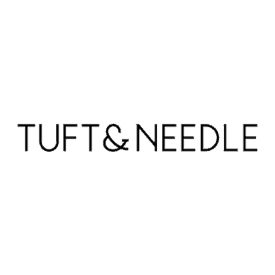 Tuft & Needle and Purple are two well-known brands in the bed-in-a-box market — and for good reason. Both mattresses emphasize relieving pressure and good bounce in order to provide a comfortable and supportive sleeping environment. Interestingly, both also use proprietary materials in the comfort layers to not only differentiate from other bedding brands, but to create two experiences for every sleeper. No time to read the full review? Click here to skip to the summary. Without further ado, let’s put these beds side-by-side and have them battle it out. They’re both bed-in-a-box mattresses. If you’re looking for an easy way to have a mattress shipped right to your door, bed-in-a-box is the way to go. 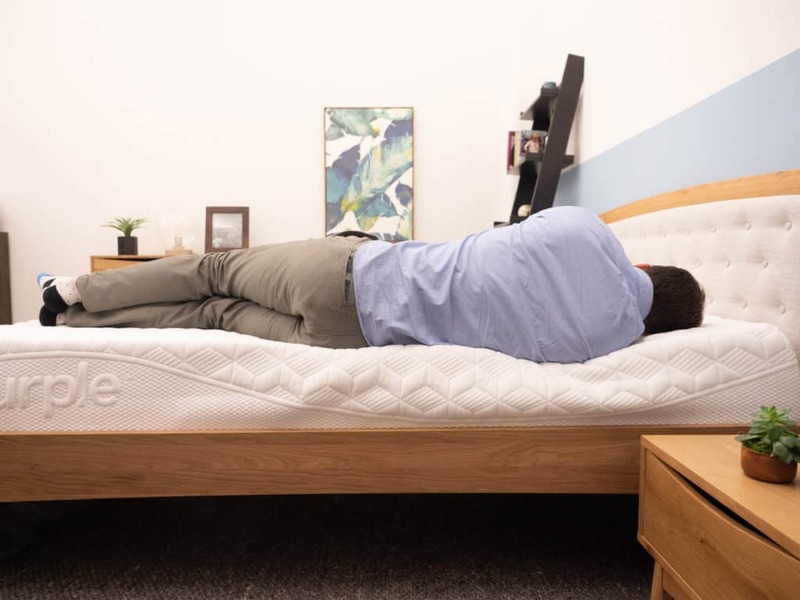 This means you won’t be able to test the mattress out in a store, but both offer free trials so you can return it, free of cost, if it doesn’t work out. Each showcases a unique material. While the comfort layer of each mattress is very different — more on that soon — both Tuft & Needle and Purple utilize proprietary materials as a way to differentiate themselves in the crowded mattress industry and provide a truly unique feel. Both focus on pressure relief. Say so-long to sore hips and limbs after a night of rest. Each mattress is constructed with pressure relief in your mind, so every spot of our body is carefully supported and cradled. Let’s look inside both of these mattresses to better understand how they’re constructed, and what this might means when it comes to quality and comfort. 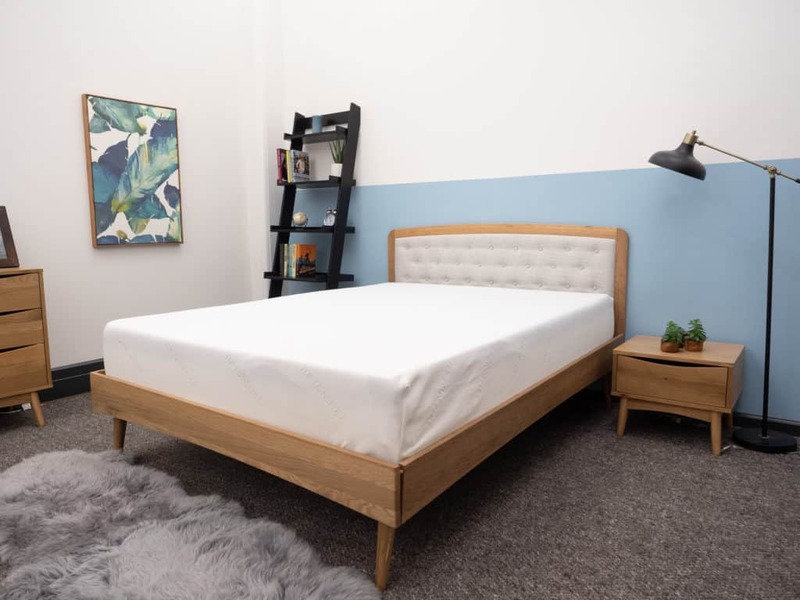 The Tuft & Needle is 10”, all-foam, bed-in-a-box mattress that is 10 inches tall that packs a serious punch with its propriety foam, breathable cover, and sturdy foundation. Cover – The cover is made from a thin and breathable polyester blend. It’s soft to the touch and will allow air to flow through in order to keep you cool. Comfort Layer – Here’s where the proprietary material comes in. The comfort layer is comprised of 3″ of Tuft & Needle foam, which provides a medium firmness, responds well to pressure, and has a nice bounce. According to Tuft & Needle, the foam provides comfort without feeling too soft or like quicksand. 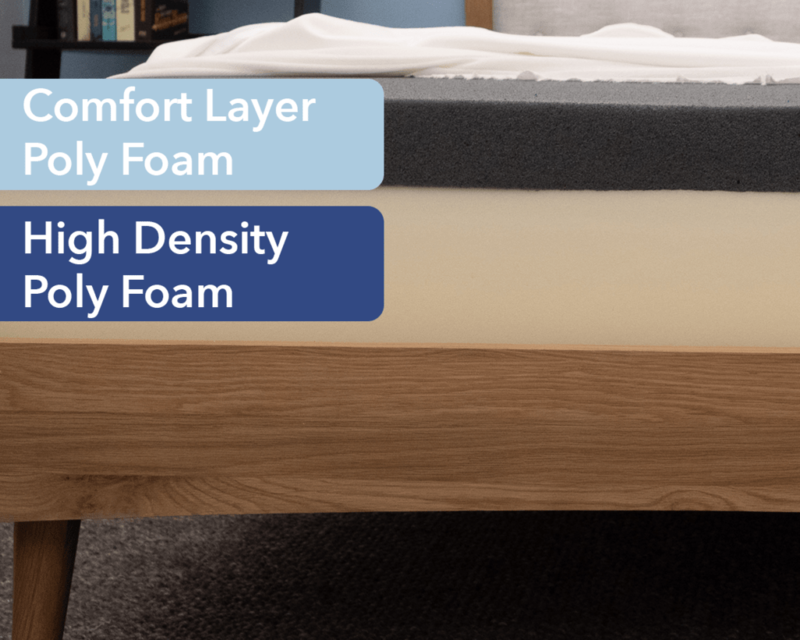 Foundation Layer – The base of this bed has 7″ of HD Poly Foam, something that’s found in most mattresses. It’s really firm and gives nice shape and support to the overall structure. One thing to note is the Tuft & Needle mattress doesn’t have a transition layer, unlike a fair amount of other beds. This “no frills” approach means the mattress will feel a bit more firm, and it will also be less expensive. More on that to come. 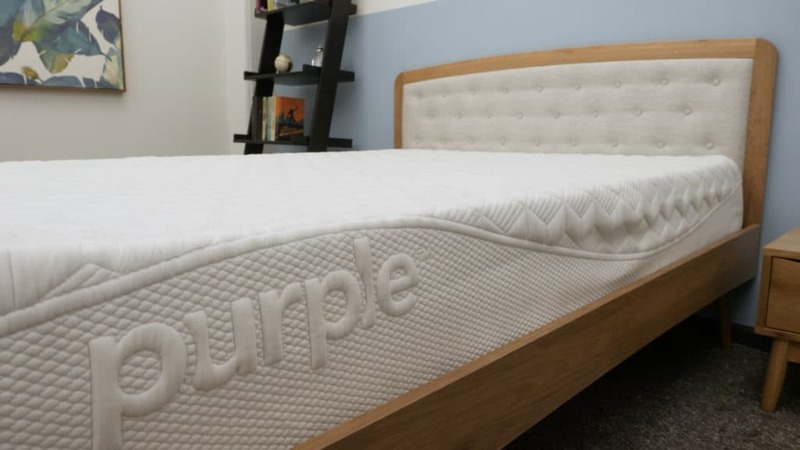 Purple is another bed-in-a-box mattress that measures just under 10 inches in height, features its propriety hyperelastic polymer grid, and has some unique characteristics to keep you cool. Cover – The cover is a polyester, viscose, and lycra blend. Lycra is found in lots of athletic clothing and wicks moisture away to help you stay cool. 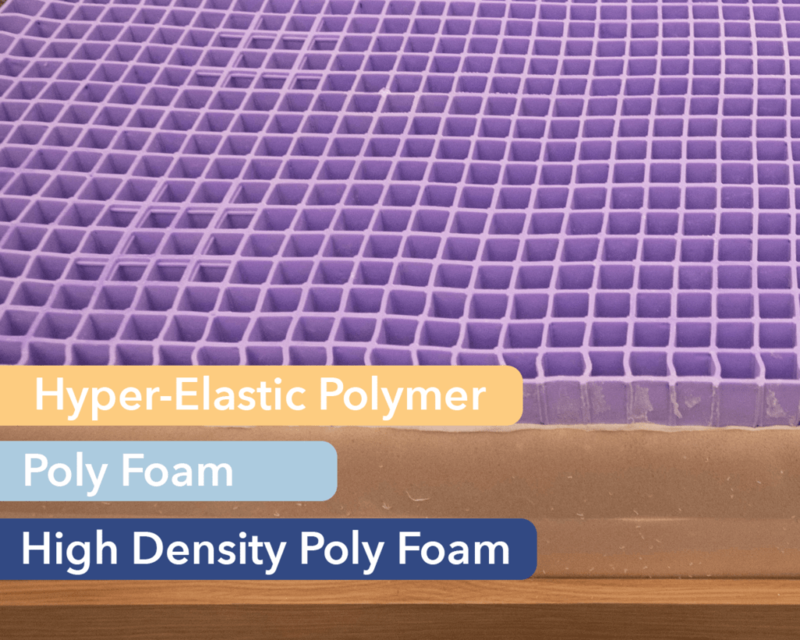 Comfort Layer – The proprietary comfort layer of the Purple mattress is 2″ of its renowned hyperelastic polymer grid, which is super bouncy and has a quick response so you can change positions easily. The grid is an actual grid, where the walls collapse around you for surefire pressure relief without the trapping, hug-like quality some memory foam beds give off. The use of this material isn’t found elsewhere on the market, giving Purple a truly unique feel in the bedding world. 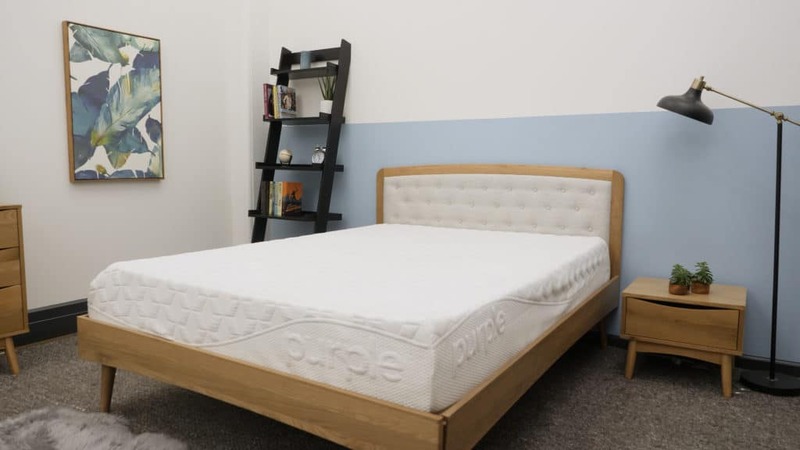 Foundation Layer – Finally, just like Tuft & Needle (and many other mattresses), the foundation layer is composed of a HD Poly Foam, a firm material meant to support the sleeper and give the bed sturdy shape. Number of Layers: Tuft & Needle is comprised of three layers, while Purple has four. In general, fewer layers might mean less, diversified support, yet that’s not exactly the case here — especially since both beds are around the same height. The reason Tuft & Needle has only two layers is because it excludes that transition layer, which makes this design a bit more basic and a touch firmer. When your body sinks through the comfort layer, you’ll move directly to the foundational layer. In comparison, the Purple mattress has a transition layer might will provide a bit more support to the body as it sinks into the bed. Comfort Layer: Tuft & Needle’s comfort layer is made from its proprietary foam, while Purple’s is made from a hyperelastic polymer grid. If you want juicy pressure relief and lots of bounce, the grid is the way to go — especially for side sleepers. If you like the feeling of foam, want something a bit more firm, and are a stomach combo sleeper, the all-foam comfort layer from Tuft & Needle is calling your name. I spent some time on each mattress to notice how it made my body feel, and what differences, if any, I could detect between each bed. While a true mattress feel is usually based on personal preference, I’ll share with you what I felt, to give you a general idea of what you might experience when you hop into bed. The Tuft & Needle mattress provides a medium-firm feel. I’d give it a 7 out of 10 on the firmness scale, with 10 being the most firm. In general, the mattress allows for a bit of sinkage while still providing pretty firm support. Back — While lying on my back, I experienced a good mix of support and pressure relief; I didn’t really feel much pressure in any one spot. The quick response from the foam means I could change positions without feeling stuck. Side — As I rolled onto my side, I noticed the firmness this bed can exude. I felt generally fine on my side, though I did feel some increased pressure in my shoulders. This is important to note, especially if you are a bit on the bigger side or have broad shoulders. Stomach — While lying on my stomach, my weight was evenly distributed across the mattress, which is a good indicator that I won’t wake up feeling sore. 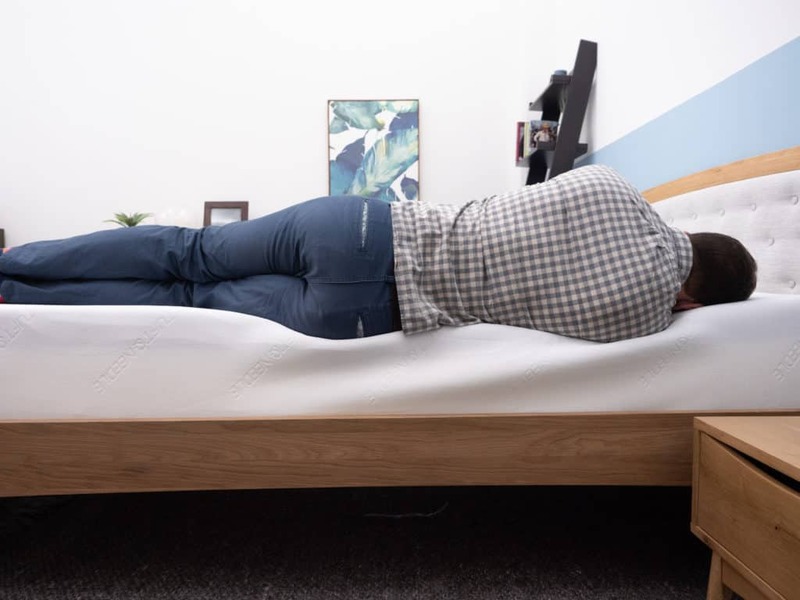 With the medium firmness level, this bed might not be supportive enough for strict stomach sleepers who need something super firm to support their core, yet if you’re a back and stomach sleeper, the medium firm feel should give you the support you need as you move around. The Purple also has a medium firmness, though I’d say it’s slightly softer than Tuft & Needle — 6.5 out of 10 on the scale. 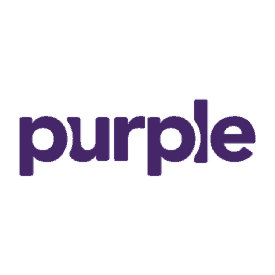 Overall, Purple’s grid structure is designed to evenly distribute weight; as you lay on the mattress, the walls of the grid collapse around the body, relieving pressure without feeling like you’re being trapped in the bed. 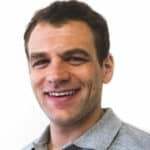 Back — When I rolled onto my back, the bounciness of the comfort layer created a floating feeling, ensuring I felt on top of the bed versus stuck in it. My weight was nicely distributed and I could change positions easily. Side — When I rolled over to my side, I did feel like my shoulders and hips received some pressure-relieving love. However, if you’re a strict side sleeper who needs something super, super plush for your side, you won’t experience that with the Purple mattress. Stomach — My weight, once again, was well distributed and supported when I switched onto my stomach. Just like Tuft & Needle, if you’re a combo sleeper, laying on your stomach shouldn’t be an issue. However, you might need something more firm if you only sleep only on your belly. 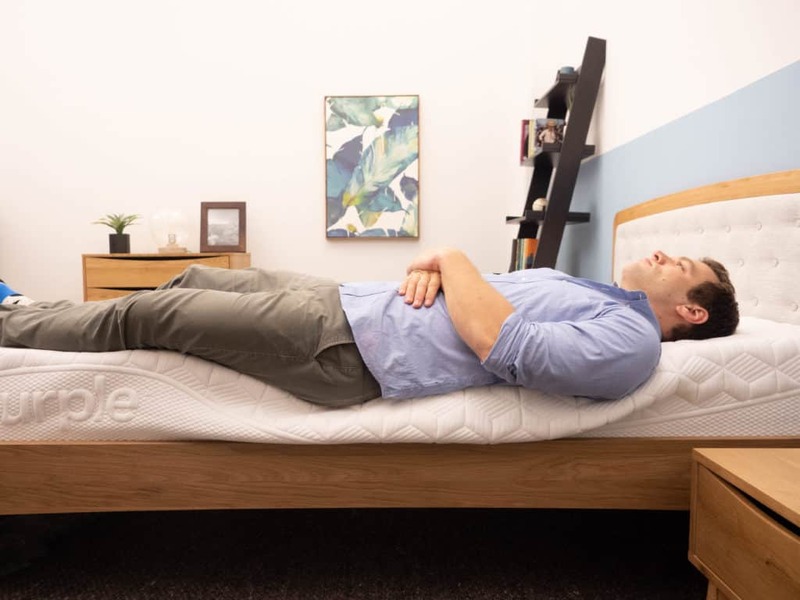 Testing sinkage helps you understand how your entire body will be supported on the bed. It looks at how the body will respond to the layers, and if you’ll be more “on top” of the bed or “in” it. To visualize how your body will respond to each mattress, I’ve placed balls of different sizes and weights (a 6 lb medicine ball, a 10 lb steel ball, a 50 lb medicine ball and a 100 lb medicine ball) on the surface of each mattress and measured how far into the structure they sank. All in all, Tuft & Needle has a bit more sinkage than Purple, though both beds provide an average amount of sinkage that I generally see in bed-in-a-box mattresses. However, for both beds, you definitely won’t feel stuck and will be able to change positions easily throughout the night. As far as bounce goes, Purple is very bouncy due to that polymer grid. 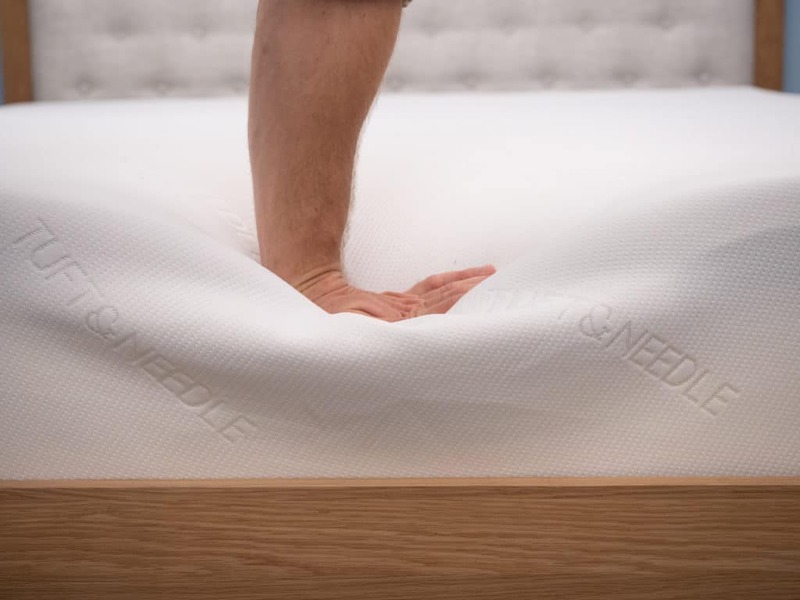 Meanwhile, Tuft & Needle has a bit more sinkage thanks to its proprietary foam, but there is also a quick response to pressure from this foam. Said another way, you won’t get the spring you normally would from a traditional innerspring, but you won’t feel stuck either. Both Tuft & Needle and Purple include additional models beyond the two we’re looking at here. To give you even more perspective, let’s look at some of the other mattresses offered on each line. In my opinion, this Mint bed is a little softer than the original mattress, making it a good option for side sleepers who need extra support for the shoulders and hips. Unlike the original, this one includes a transition layer for a bit more comfort and support, along with edge support — which is great if you tend to roll towards the edge of the bed. A Queen is priced at $895, making this more expensive than the original Tuft & Needle mattress. Unlike the original Purple, these beds do not come compressed in a box. They also come in varying heights, thanks to the different hyper-elastic polymer comfort layers. There is HD polyfoam around the edges of the bed for edge support to you don’t feel like you’re falling off the ends of the mattress. Each mattress will be priced higher than the original Purple. For comparison, The Purple 3 in a Queen size comes in at $2,200, versus the original Purple, which is priced at $999 for a Queen. 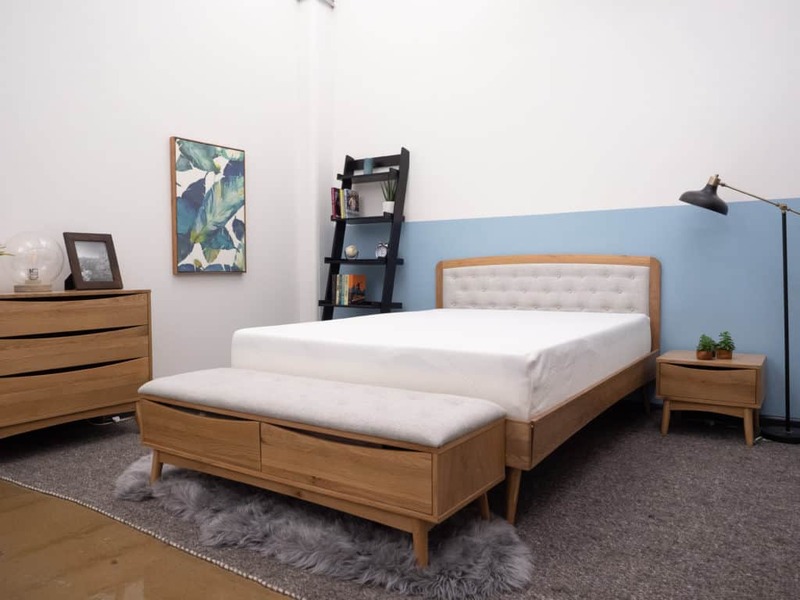 If you’re thinking about buying either of these beds, you probably want to know all about shipping, trial periods, and warranty information. It’s pretty similar across the board, except for price point. Finally, let’s talk cost. This is where you’ll see a pretty significant difference between the two beds. Without the transition layer in the Tuft & Purple, this bed will be a “no frills” option that also comes with a lower price tag. Having fully assessed each bed, there are a few key takeaways. 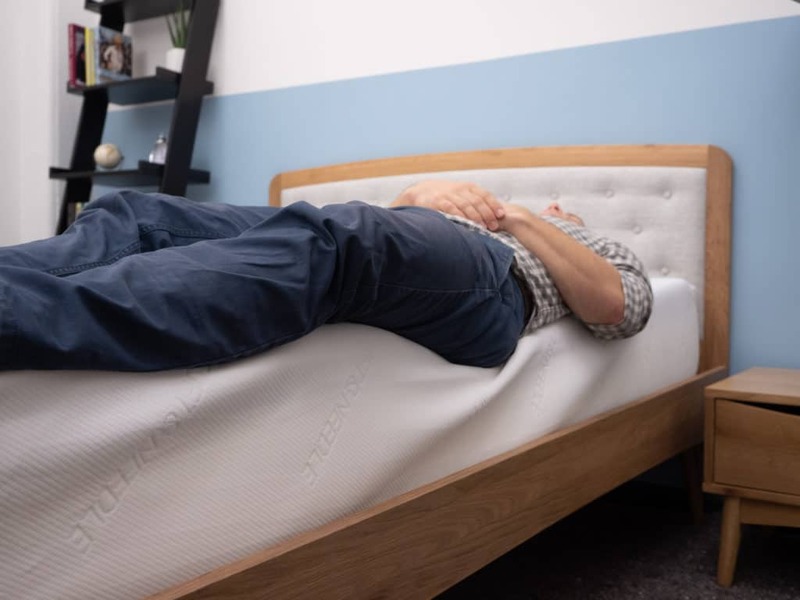 All in all, both mattresses will do a good job at relieving pressure, and you’ll be able to easily move around to different sleep positions throughout the night. Tuft & Needle is a bit more on the basic side, since it excludes a transitional layer. This also means the bed will be slightly firmer — something that could benefit stomach sleepers who need strong support for their hips and core. 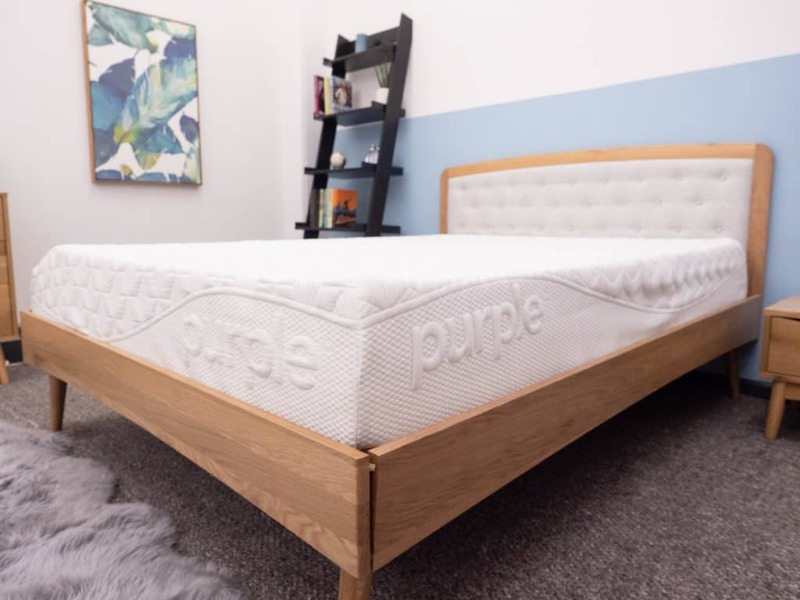 While it isn’t as bouncy as the Purple bed, and heat might be trapped in the foam, it is significantly more affordable, making it a good option for people who want quality materials without spending a ton. On the flip side, Purple is a lot bouncier than Tuft & Needle, meaning it will feel like you’re floating on top of the bed while your weight is equally distributed. This bed is also slightly softer, meaning it’s good for side sleepers who need a little extra love for their shoulders and hips. While it’ll cost more, it also will do a good job at keeping cool, thanks to its proprietary grid structure and Lycra cover. The first thing to figure out is the bounce. Do you like your mattress to be super bouncy? Do you move around a lot when you sleep? If so, then the Purple bed might be calling your name. The second comes down to firmness. The Tuft & Needle bed will be slightly more firm, making this a good option for back and stomach sleepers. If you’re a side sleeper who needs a little more plush support, Purple might be the way to go. And finally, let’s talk about price. A Tuft & Needle Queen is $575, while the Purple Queen is $999. If you’re on a certain budget, this fact might make or break your mattress decision. This mattress is made with a no-frills construction, providing a balanced feel of support and pressure relief. It’s a quality mattress that’s also affordable. This mattress doesn’t skimp out on quality, and still provides a reasonable price point. Take note, hot sleepers! The proprietary grid will allow air to flow through the mattress, ensuring you stay cool throughout the night. The bed provides a lot of bounce, especially for a bed-in-a-box mattress. This provides a feeling like you’re floating above the bed, allowing you to change positions with ease. 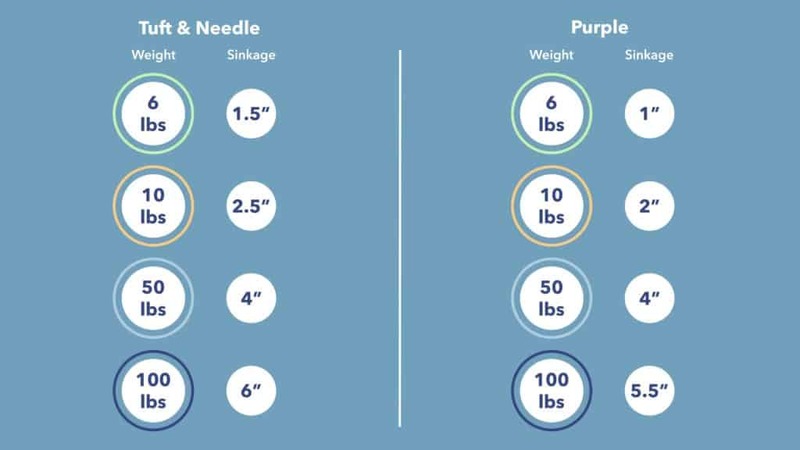 That does it for this Tuft & Needle vs Purple comparison! If you have any more questions or comments, please feel free to leave a message on the video.